The alphorns on this CD leave their myths and clichés far behind. Here, the alphorn becomes an autonomous instrument. 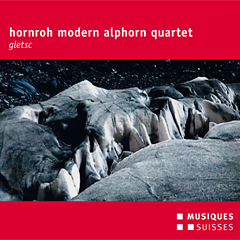 It is precisely this natural interaction with the instrument that allows us to hear it afresh, opening up new perspectives for it – and all without driving out the glacier spirit that nests in this natural horn. From the text Slow Listening written by Cécile Olshausen about the new CD ‚gletsc’ with compositions from Misch Käser, Georg Haider and traditional pieces.